For most of my career, I have studied rocks and dirt. My bread and butter? Landslides and sediment. I have had a bit to say on the subject. Bragg, H.M., Sobieszczyk, Steven, Uhrich, M.A., and Piatt, D.R., 2007, Suspended-sediment loads and yields in the North Santiam River Basin, Oregon: U.S. Geological Survey Scientific Investigations Report 2007-5187, 26p. The North Santiam River provides drinking water to the residents and businesses of the city of Salem, Oregon, and many surrounding communities. Since 1998, water-quality data, including turbidity, were collected continuously at monitoring stations throughout the basin as part of the North Santiam River Basin Turbidity and Suspended Sediment Study. In addition, sediment samples have been collected over a range of turbidity and streamflow values. Regression models were developed between the instream turbidity and suspended-sediment concentration from the samples collected from each monitoring station. The models were then used to estimate the daily and annual suspended-sediment loads and yields. For water years 1999–2004, suspended-sediment loads and yields were estimated for each station. Annual suspended-sediment loads and yields were highest during water years 1999 and 2000. A drought during water year 2001 resulted in the lowest suspended-sediment loads and yields for all monitoring stations. High-turbidity events that were unrelated or disproportional to increased streamflow occurred at several of the monitoring stations during the period of study. These events highlight the advantage of estimating suspended-sediment loads and yields from instream turbidity rather than from streamflow alone. Sobieszczyk, Steven, Uhrich, M.A., and Bragg, H.M., 2007, Major turbidity events in the North Santiam River basin, Oregon, Water Years 1999-2004: U.S. Geological Survey Scientific Investigations Report 2007-5178, 50p. Although heavy precipitation caused basinwide erosion that increased turbidity in streams, a major turbidity event often required at least one landslide or similar type of contributing source to introduce enough sediment to raise the turbidity value to greater than 250 Formazin Nephelometric Units. Different processes drove sediment loading at different times. In general, precipitation eroded sediment from source areas or induced landslides. However, in two cases, warm temperatures caused rapid snowmelt, which supplied the water necessary to erode unconsolidated glacial soils or other sediment material and increase turbidity. Some source areas, such as existing earthflows, repeatedly supplied a large volume of sediment to streams, whereas other sources, such as landslides or debris flows, were unpredictable and sporadically supplied large volumes of sediment to streams. Major turbidity events were well distributed throughout the North Santiam River basin; discrete events were observed in each of the five subbasins along unregulated streams. Suspended-sediment loads and clay-water (persistently turbid water) volume estimates were event-specific and varied greatly between major turbidity events, even though, in some cases, the source area was the same; however, high yields generally were observed for events in the Blowout Creek, Breitenbush River, and Little North Santiam River subbasins. Suspended-sediment loads for each 3-day precipitation-driven major turbidity event supplied greater than 36 percent of the annual load, and snowmelt-driven events supplied greater than 27 percent of the annual load in a single day. Clay-water yields for event periods generally were highest in the Little North Santiam River subbasin. In addition, average annual percentage of clay-water volume during the period of record was highest in the Little North Santiam River. The second highest average was in Blowout Creek. Sobieszczyk, Steven, 2010, Using Turbidity Monitoring and LiDAR-Derived Imagery to Investigate Sources of Suspended Sediment in the Little North Santiam River Basin, Oregon, Winter 2009–2010: M.S. Thesis, Portland State University, 262p. The Little North Santiam River Basin is a 111-square mile watershed located in the Cascade Range of western Oregon. The Little North Santiam River is a major tributary to the North Santiam River, which is the primary source of drinking water for Salem, Oregon and surrounding communities. Consequently, water quality conditions in the Little North Santiam River, such as high turbidity, affect treatment and delivery of the drinking water. Between 2001 and 2008, suspended-sediment loads from the Little North Santiam River accounted for 69% of the total suspended-sediment load that passed the treatment plant. Recent studies suggest that much of this sediment originates from landslide activity in the basin. Using airborne Light Detection and Ranging (LiDAR)-derived imagery, 401 landslides were mapped in the Little North Santiam River Basin. Landslide types vary by location, with deep-seated earth flows and earth slumps common in the lower half of the basin and channelized debris flows prominent in the upper basin. Over 37% of the lower basin shows evidence of landslide activity compared to just 4% of the upper basin. Instream turbidity monitoring and suspended-sediment load estimates during the winter of 2009-2010 demonstrate a similar distribution of sediment transport in the basin. 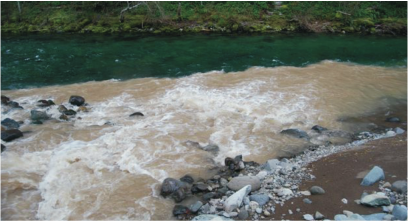 During a 3-month study period, from December 2009 through February 2010, the lower basin supplied 2,990 tons, or 91% of the suspended-sediment load to the Little North Santiam River, whereas the upper basin supplied only 310 tons of sediment. One small 23-acre earth flow in the lower basin, the Evans Creek Landslide, supplied 28% of the total suspended-sediment load, even though it only comprises 0.0004% of the basin. The Evans Creek Landslide is an active earth flow that has been moving episodically since at least 1945, with surges occurring between 1945 and 1955, 1970 and 1977, in February 1996, and in January 2004. Recent erosion of the landslide toe by Evans Creek continues to destabilize the slope, supplying much of the sediment measured in the Little North Santiam River. Over the last 64 years, the average landslide movement rate has been between 5 and 12 feet per year. Certain water-quality parameters relate to one another in expected ways. For example, heavy rain will cause both stream discharge and turbidity to increase as runoff erodes surface materials into nearby streams. The magnitude and timing of the responses between the two parameters can be predictable. When these relations hold, it provides scientists with a sense of assurance that instream monitoring data are not spurious. However, when these expected relations do not occur, opportunities arise for investigation, insight, and interpretation to lead to discovery of something new. In the Cascade Range, Oregon, sediment contributed from landslides can produce a much different turbidity signature from that commonly observed when turbidity and discharge increase concurrently. Many examples exist of this decoupling, or separating, of turbidity from discharge, but only two streams with distinctly different landslide sources are explored here. The Evans Creek earthflow, located in the lower Western Cascades, contributes a consistent supply of sediment, regardless of streamflow. Stream incision of the landslide toe erodes sediment year-round. In addition, sediment production increases, as does the magnitude of turbidity, later in the winter, as accumulated rainfall continues to saturate the soil and raise a shallow groundwater table. In contrast, a series of debris flows between 2000 and 2006 on Mount Jefferson’s western flank continued to produce unique, isolated turbidity peaks, sometimes hours ahead of elevated discharge. Since collapsed snowfields can trigger debris flows, sometimes temperature, not rainfall, is responsible for increasing turbidity while having little effect on streamflow. These landslide-related turbidity signatures demonstrate that sediment contribution to streams in landslide-prone areas is often more complicated than assuming that an increased discharge corresponds to an increased turbidity.